Is that a question that I see before me? January 17, 2013 6:42 pm / 2 Comments on Is that a question that I see before me? I had an epiphany. OK, maybe a little itsy teeny epiphany, but an epiphany nonetheless. I blogged about being overwhelmed by the sheer amount of information that I felt coming at me. In the comments, Jeff Merrell likened it to a firehose and offered me some really good advice. In fact, his really good advice collided with my most recent classroom practice, and that’s what provided the flash of insight. My sophomores (honors students, for what it’s worth) are doing a research paper right now. Let’s call it a research project that ends in a paper, because really, the paper is just the end result of a process. Anyway, I wanted to give them a way to manage their information and their ideas to really focus on what they decide is essential. In keeping with my belief in the importance of student choice, I gave them broad subject areas, but they were then to choose a topic, do some high-level, introductory reading, and then develop a “just right” research question to focus their research as they moved into the note-taking phase. A simple idea, and not overly ground-breaking. But, it has broken ground for these kids. Student after student has told me how well their research is going with a question instead of a topic to guide them. They’ve wrestled with their questions: some were too broad, and needed to be narrowed. Some were so narrow as to be untenable. But overall, this whole research question thing has worked wonders. So, when Jeff wrote of a friend’s advice “that the best way to make the firehose seem less like a firehose is to have a question in mind. It helps you focus and pick out things that are relevant. And ignore the rest of the stream,” it was like that crazy cliched lightning bolt. This research question that worked so well with my sophomores was the very thing that was going to help me survive and thrive in ETMOOC. What are some best practices for integrating tech into an English classroom? How do teachers deal with access to tech (and lack thereof)? Can I write grants for tech? How? What are the expectations for my students’ digital literacy when they graduate? How can I get them there? How does tech tie into the core standards? Is ISTE’s NETS something I should pay attention to? Is there value in pursuing advanced education in ed-tech? Duck! It’s another hash tag! January 15, 2013 3:39 pm / 9 Comments on Duck! It’s another hash tag! 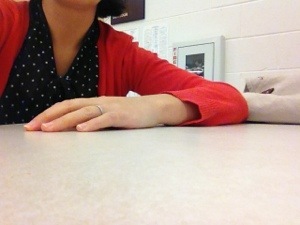 This is a picture of me, sitting at a cafeteria table, 3rd period, gloomy Tuesday, monitoring study hall. My colleague Rose is on the other side of the table–outside the frame–diligently working through a stack of grading. An observant reader may notice the lack of stack in front of me. A thoughtful reader, and a particularly kind one, may silently congratulate me on the absent stack. Not so fast, Dear Reader; it’s upstairs. Mildly sorted. In a bag. On a chair. Behind my desk. What a particularly astute reader still may miss is that the picture above is of an ostrich with her head in the sand, which may or may not be the first of several analogies used to mediocre effect in this post. Why is my head buried is that imaginary sand? It’s my response to overwhelming amounts of input, and it’s a personal intellectual, and perhaps emotional, failing of mine. “Everything but the kitchen sink” makes me run from the kitchen. What does this have to do with EdTech and media? How could this possibly be an #ETMOOC post? I’ve started using my Twitter account again and also, last night, joined an #ETMOOC orientation session on the Blackboard Collaborate space. There were a lot of interesting ideas tossed around, like about digital citizenship and making learning visible, but I had a hard time thinking about them (and kept jumping to other pages during the session, thereby “checking out”) because I was overwhelmed. There’s no aha moment here, no clarity of vision, no life changing ideas. Perhaps, Reader, you can offer some in the comments? So, I just made this comic introducing myself. It took me 25 minutes. Easy tool, and now I’m wondering about using it with my students. 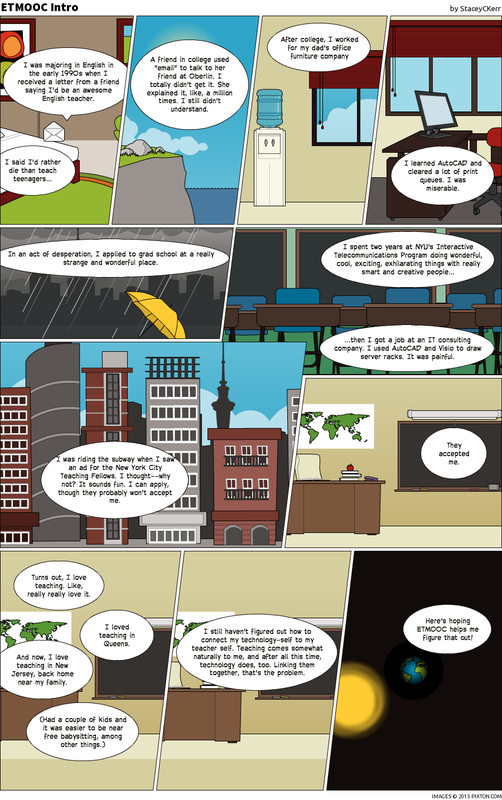 I’m not happy with how small it looks (you’ll need to click and click again to be able to read it), but I’m still pleased. I’m setting up this blog with the intent of participating in the Educational Technology Massive Open Online Course that begins next week (Jan 14, 2013). Perhaps you’d like to join me?